Newly designed SHR adopts OPT light, able to eliminate the energy peak at the initial part of pulse and make the efficacy more significant with less side effect. 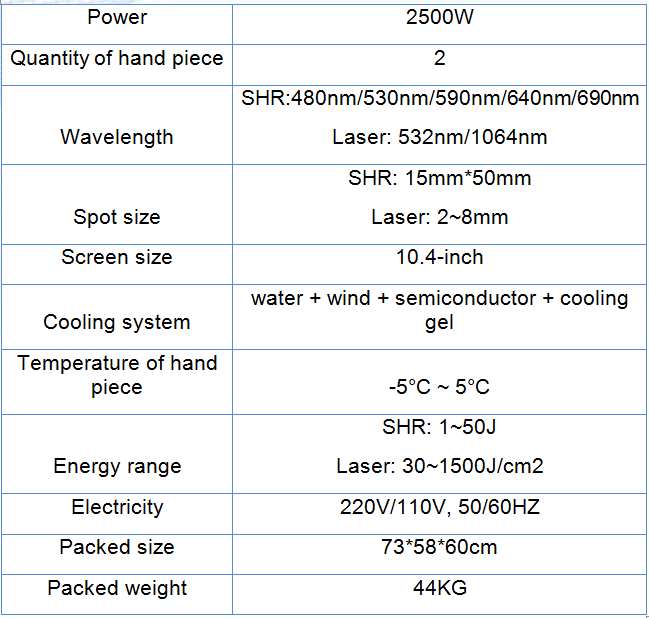 Q-switch technology is the technology to compress the general output of continuous laser energy into a pretty narrow pulse, so that the peak power of light source can be increased by several orders of magnitude. The SHR+Laser two-in-one system rises in response to the different requirements of those who pursue for beauty and the excellence of skin, reaching the purposes of both hair removal and tattoo elimination. Chemical changes occur to the molecular structure of collagenous and elastic fibers after they’re stimulated by light, decomposing, accreting and rearranging so as to restore original elasticity. The thermal interaction produced in the process can reach the effect of removing wrinkles, shrinking pores and whitening skin by strengthening vascular function and improving circulation. Pyrolysis makes hemoglobin absorb a lot of heat in a flash, while selective pyrolysis makes the temperature of follicles rise in no time, which decomposes nutrition group and makes hair fall off naturally. Adopting light-induced blasting theory, Q-switch laser can penetrate skin epidermis and finally reach its deep layer within the ultra-pulsed time of microsecond or millisecond grade. In this way, the pigment granules inside of skin can be crushed and then popped out of body immediately or carried away slowly after being swallowed by macro phages. Since laser with specific wavelength is capable of going deep into pigment-diseased tissues, superficial layer and normal skin won’t be damaged at all. Five filters are designed for SHR aiming at six different skin problems, and two probes for Nd:Yag Laser to remove both light and dark coloring matters. This system can save much space compared to two separated machines. The large spot size of 15*50mm (SHR) and 2~8mm (Laser) as well as the maximum frequency of 10HZ makes the treatment process easier and faster. 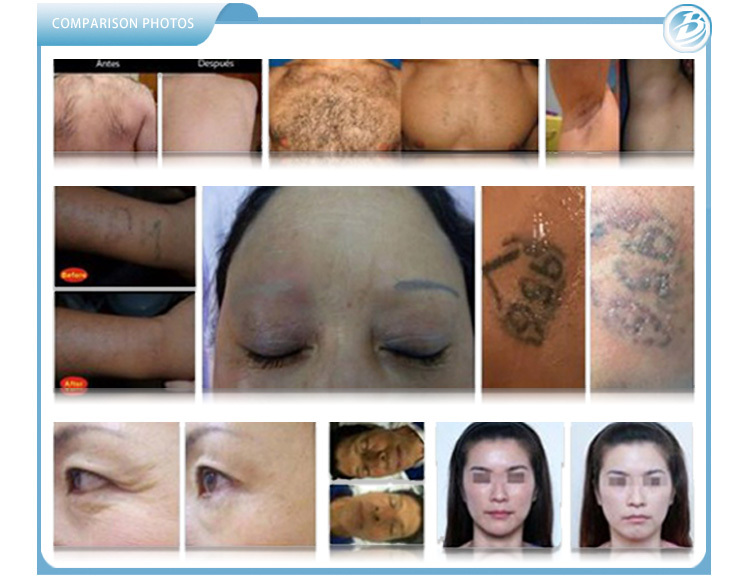 No appearance of the side effect brought by traditional laser treatment. Remarkable design allows operators to adjust pulse width according to skin colors, applicable functions and treatment areas. There won’t be any trauma or harm to skin tissues.